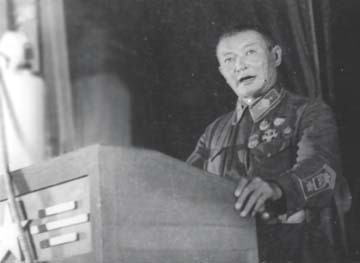 Choibalsan, first Communist dictator, courtesy of the National Museum of Mongolian History. The Communist government - with help from its Soviet allies - accomplished a lot in Mongolia. It destroyed feudalism, fostered industrialization and urbanization, introduced modern medicine, and achieved almost universal literacy. Herders' standard of living - measured in health, education, and material comforts - was much higher than in feudal times. 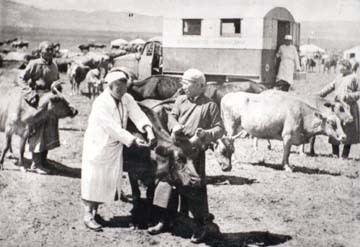 Veterinarians caring for the cattle on a farm cooperative, 1948, courtesy of the National Museum of Mongolian History. · People resented having their private property confiscated and being forced to work for the state. · They were angry that the government told them what to study, what job to perform, where to live, how to give birth. · They had to answer to a totalitarian state that held elections with only one candidate for each position. · Those who opposed the government were silenced through death or exile. · They were surrounded by Russian and Eastern bloc "consultants" who held most of the management positions in industry and the large agricultural/herding collectives. 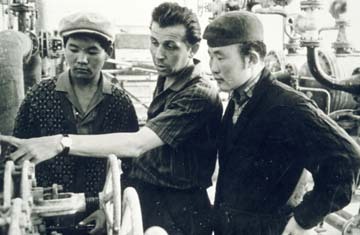 A Russian teaching Mongolians how to work machinery, courtesy of the National Museum of Mongolian History. Communism also accelerated cultural degeneration. The Mongolian way of life began to fade as public religious celebrations and other customs were repressed and replaced with Western forms - from Bach and Verdi to Russian boots.